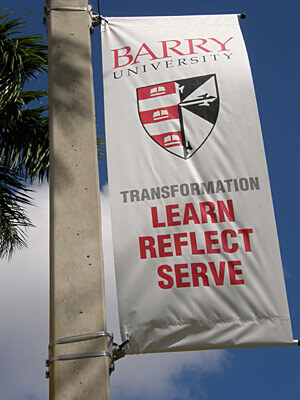 Barry University is a Catholic institution of higher education founded in 1940 by the Adrian Dominican Sisters. Grounded in the liberal arts tradition, Barry University is a scholarly community committed to the highest academic standards in undergraduate, graduate and professional education. In the Catholic intellectual tradition, integration of study, reflection and action inform the intellectual life. Faithful to this tradition, a Barry education and university experience foster individual and communal transformation where learning leads to knowledge and truth, reflection leads to informed action, and a commitment to social justice leads to collaborative service. Barry University provides opportunities for affirming our Catholic identity, Dominican heritage, and collegiate traditions. Catholic beliefs and values are enriched by ecumenical and interfaith dialog. Through worship and ritual, we celebrate our religious identity while remaining a University community where all are welcome. Catholic intellectual and religious traditions guide us in the fulfillment of our mission. The mission and values of the Adrian Dominican Sisters serve as the inspiration for our core commitments. Barry promotes and supports the intellectual life, emphasizing life-long learning, growth and development. The University pursues scholarly and critical analysis of fundamental questions of the human experience. In the pursuit of truth, the University advances development of solutions that promote the common good and a more humane and just society. Barry is a global, inclusive community characterized by interdependence, dignity and equality, compassion and respect for self and others. Embracing a global world view, the University nurtures and values cultural, social and intellectual diversity, and welcomes faculty, staff, and students of all faith traditions. Barry expects all members of our community to accept social responsibility to foster peace and nonviolence, to strive for equality, to recognize the sacredness of Earth, and to engage in meaningful efforts toward social change. The University promotes social justice through teaching, research and service. Barry is committed to serving local and global communities through collaborative and mutually productive partnerships. The University accepts responsibility to engage with communities to pursue systemic, self-sustaining solutions to human, social, economic and environmental problems. Approved by the President and the Executive Committee of the Administration on May 15, 2008; approved by the Board of Trustees on May 30, 2008; submitted to the General Council of the Adrian Dominican Sisters for final approval; Council approval received via letter from Sister Rosa Monique Peña, OP on June 20, 2008.